It seemed when I was a young comic collector you were either a DC comics kid or a Marvel kid. I was definitely the latter. For some reason to me, Marvel just seemed cooler. Cooler powers, cooler names, cooler costumes. Fantastic Four, Xmen, The Amazing Spiderman were all staples for me growing up. Compared to those, Superman seemed like a bit of a dork. Eventually DC brought out their grittier Batman series and their Vertigo line. Only then did I even begin buying DC comics. Here are some recent sketches of Marvel characters (Nightcrawler and The Scarlet Witch) from Drawing Jams, and also an older abandoned Xmen submission to Marvel. this is the best blog out there, keep rockin' it! 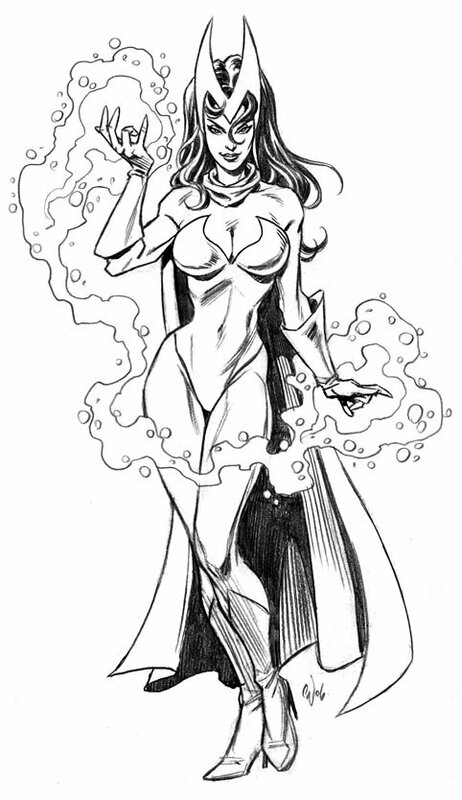 Found my way over to this blog through the Avengers jam going on over at the DrawingBoard. Amazing work, Chris. I'm going to link this blog to my own, and hopefully it'll earn you a little more well-deserved traffic. I'll be here often. Chris these are awsome and I do agree with you about growing up a marvel kid. 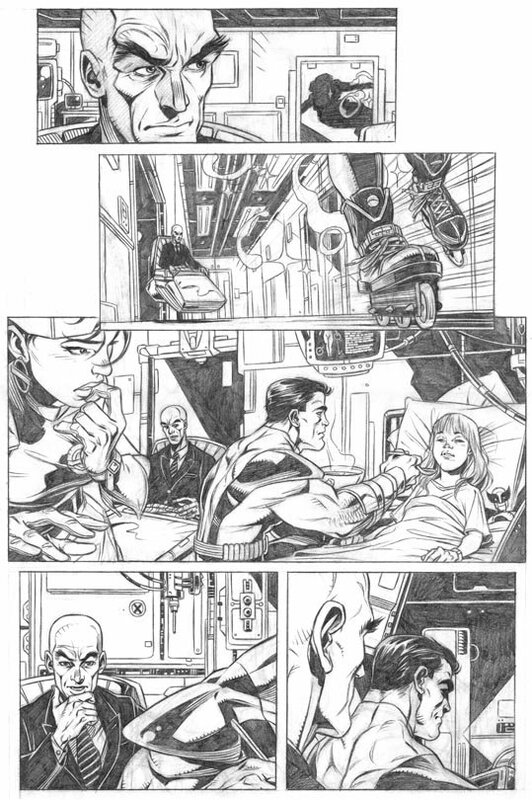 It seemed like all the art for DC when I was growing up was anticuated and dull. Now they are definetly bringling out the big guns but back then Marvel ruled for sure! Your making me want to draw some Nightcrawler right now. Were there more pages to that X-Men submission? Hot! I'm Marvel geek too and these are awesome, Chris. 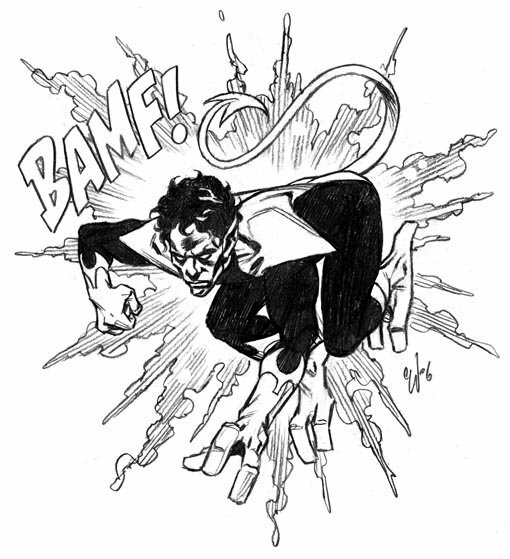 That nightcrawler just totally rules! I've been really enjoying your work Chris. I'm curious to know what caused you to abandon the submission to Marvel - other projects called to you more? They're fabulous pencils. Mike- Thanks for the link. Hayden- I did one panel for page two, then abandoned it. azahru- Thanks. After the second page started badly, I just lost confidence. You lost confidence? Wow, I guess it can happen to anyone, you've got the technical prowess and the ability to give characters life. If that's you're only reason I guess you'd better get going again! I didn't hold marvel in particularly high esteem until I read Truth: Red White and Black, Captain America's true origin story. Now I'm thinking it might be worth a visit sometime. adam- Thanks, glad to see I did the characters justice. One reason why I draw in so many different styles is that I get bored very easily. I think I'd go a bit stir crazy if I had to draw a monthly comic book. It would have to be a project I was really passionate about. But, no plans to do anything just yet. I do kinda miss it though, the whole storytelling process. As you mentioned, besides a few pages here and there, I really haven't drawn any comics since my Platinum days.